Sometimes, when you start drinking, things just get out of hand. 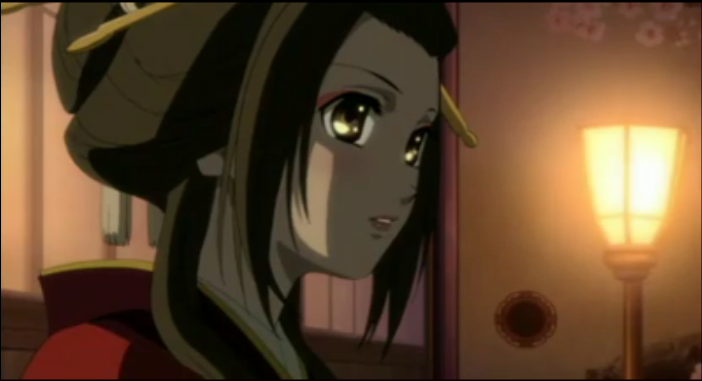 In episode 8 of Hakuouki, Sen gets more involved in the plot, disagreements surface within the Shinsengumi, Harada’s men are attacked by Chizuru’s look-alike, and everyone goes to an ochaya (tea house) in Gion, where the drinking leads one member to dress up in women’s clothing (yes, a double-reverse trap). Chizuru and O-Sen snack on odango. 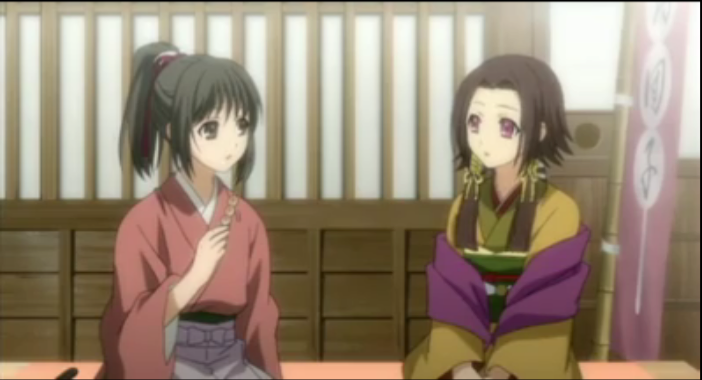 Sen invites Chizuru out for snacks and small talk, ostensibly to cheer Chizuru up, but she asks a number of questions, such as, “do you have any siblings?” She also seems very interested in Chizuru’s sword. Is this a demon sword? Chizuru feels better after relaxing with her new friend, but there are other problems afoot. 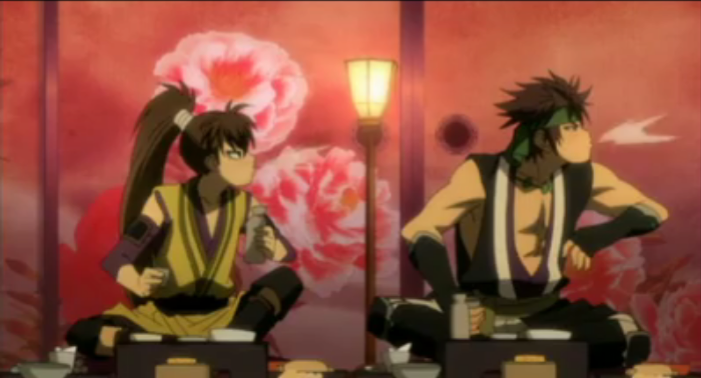 For one thing, there is tension between the original Shinsengumi and the newer members (including Itou). 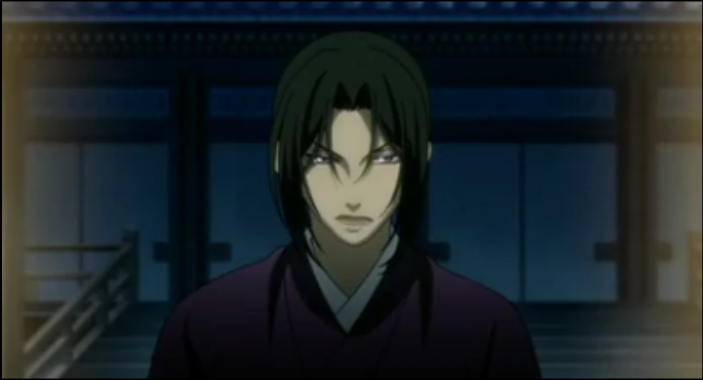 Nagakura gets vocal about his problems with Hijikata’s leadership while drunk, and when Hijikata catches Nagakura and a couple of the others coming home late, he reminds them that breaking curfew is punishable by seppuku. Hijikata's sense of justice would be admired by Dracon. The 2nd to last Shogun, Tokugawa Iemochi, died in 1866. Vandals tear down a bulletin board that condemns the Choushuu clan as traitors, so the Shinsengumi are ordered to guard its replacement. During his watch, Harada and his men are attacked by a band of samurai. 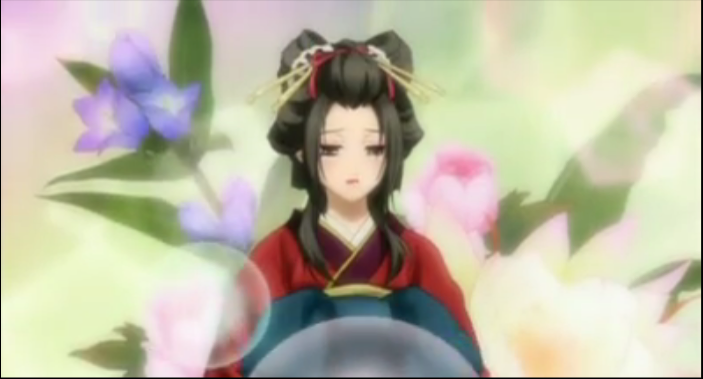 Though he manages to fight off the attackers their leader is revealed to be a woman who looks exactly like Chizuru. Whose face is behind that mask? Chizuru's! Harada takes everyone to an ochaya in Gion with his reward money. As they get drunk inhibitions loosen, and Harada asks Chizuru if she was out that night. 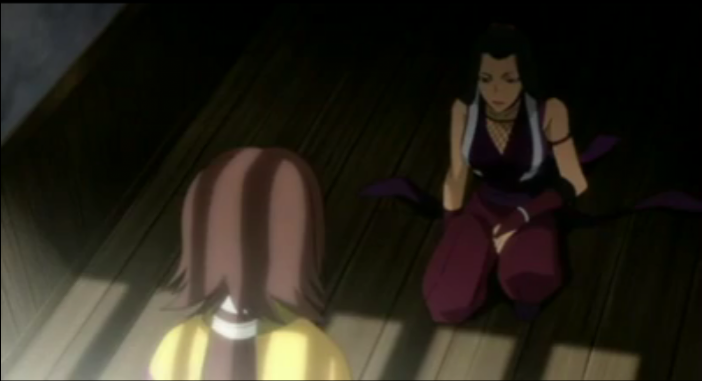 Okita suggests the culprit might be Nagumo Kaoru (met briefly in episode 6). In their drunken enthusiasm, they get Chizuru to dress “as a girl”. No, they're not looking at Chizuru. This was actually a pretty funny moment. Chizuru cleans up real well. Chizuru Yukimura, the double-reverse trap. Throughout all this, Kimigiku, the woman entertaining the Shinsengumi for the evening, had been listening carefully to their discussion. She steps outside and recognizes the three oni, who are out on the street. 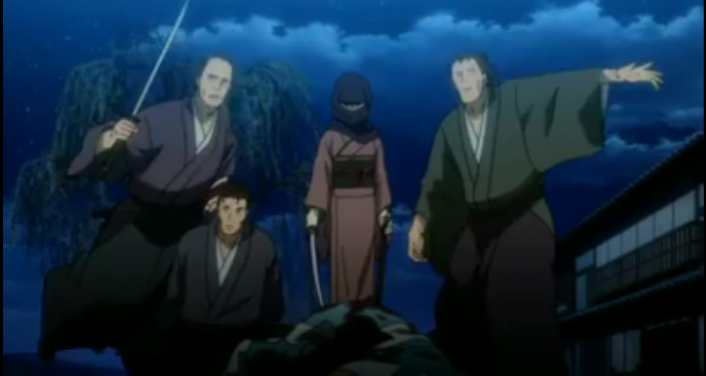 Finally it is revealed that Kimigiku is the ninja seen at the beginning of episode 4, and she was with Sen after all. So that was Sen who had the ninja! Unanswered questions: The plot is really coming together, but some big questions remain. Who is Sen? Most people don’t have a personal ninja, and she obviously knows a lot about Chizuru and the oni. Who is Kaoru? 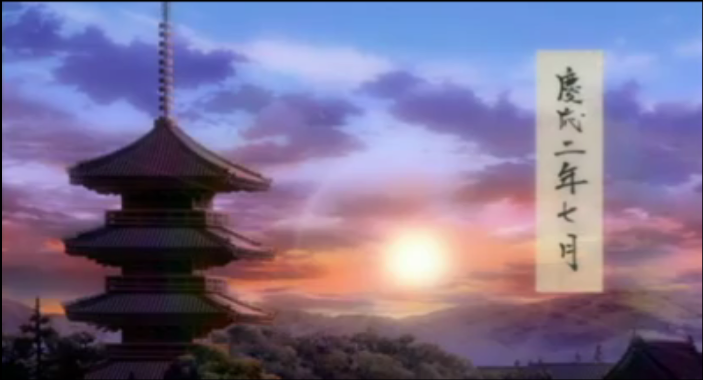 Obviously she is anti-bakufu, does that mean she is working with the three oni? And why does Kaoru look like Chizuru? What will come from the factionalism inside the Shinsengumi? What exactly is Chizuru? Will she be reunited with her father? And what role will the three oni, and the Rasetsu brigade play in all of this? 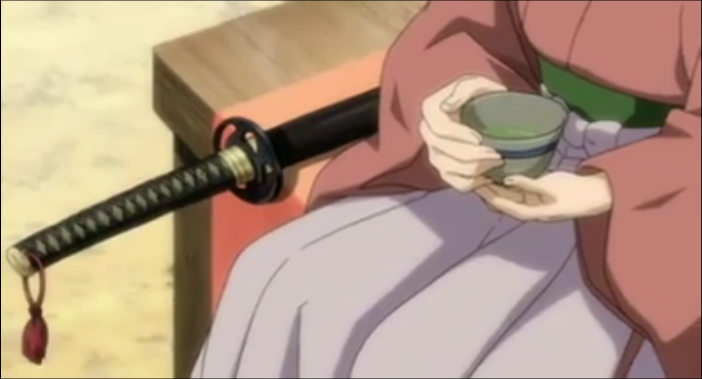 I loved that moment when Kimigiku was with Hijikata. She told him that the Shinsengumi wasn’t very popular, but Hijikata is as handsome as an actor, and all he said was, “I get that a lot” while sipping his sake xD. Sigh. I love this anime. I don’t really need the answers right away. After all the series will be over soon.